Yeah so fine. I'm not really on much of a blogging break anymore. :) I'm still twittering, reading other blogs, and doing a heck of a lot of work. I still have a lot of BBAW (Book Blogger Appreciation Week) tasks to wrap up, some new projects in the works, and stuff like that. Essentially, my recent trip to DC was just enough to give me a break and remind me to take the pressure off myself. Additionally, I had absolutely no idea how committed this week was! (no I don't use a blogging calendar) I put off a lot of blog tours to this week thinking once BBAW is over I'll be fine, forgetting that I wouldn't have had time to read many of the books. But I'm really trying to slow down on commitments since I envision a much different purpose for this blog and my reading next year. 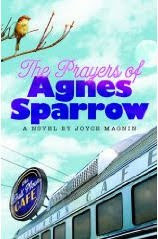 About The Prayers of Agnes Sparrow by Joyce Magnin: The Prayers of Agnes Sparrow is the story of an unusual woman, Agnes Sparrow. No longer able or willing to leave her home, where she is cared for by her long-suffering sister Griselda, Agnes has committed her life to the one thing she can do-besides eat. Agnes Sparrow prays and when Agnes prays things happen, including major miracles of the cancer, ulcer-healing variety along with various minor miracles not the least of which is the recovery of lost objects and a prize-winning pumpkin. ooh - you are being all mysterious! I like it! As a new blogger, I found it very exciting when I started reviewing ARCs, but soon realized that deadlines took some fun out of it. Plus I have hundreds of wonderful books sitting on my shelf that I WANT to read desperately. So I have decided to dial it down a bit on commitments and focus on my home stash. I am curious about your visions for your blog in the future, and what brought about this shift. Any hints? I hope that your trip to DC was relaxing and fun for you. It was great to see you and the others again. I wish there had been more time to chat, but alas mom was exhausted by the time dinner rolled around. I have a similar issue with ARCs and commitments. I'm trying to slow down on those as well.